The transition from a girl to an adult woman is an important event in almost every culture. Latino/as, however, mark this memorial occasion with a celebration of a Quinceañera. A celebration of a Quinceañera is a Hispanic tradition associated with Mexican, Central, and South American Cultures. Through different ceremonies that take place today, a Quinceañera is a formal presentation of the young woman to society and also give thanks for her having reached the age of 15. If you would like a Quinceañera service for a young woman please call 512-836-3974 or send an email (info@austinstjohns.org) to obtain a date. You may also attend any Sunday Service and contact the Rector after the service ends. It is very important to contact the Rector as soon as possible because the availability of the church and the priest are subject to schedules. 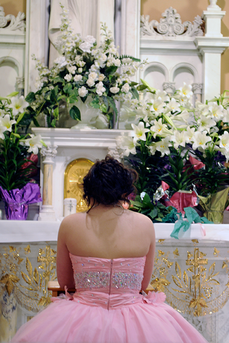 For a Quinceañera, a meeting between the Rector and the Quinceañera is required at a minimum of two weeks before the service, and a practice session for the Quinceañera - with the Quinceañera, her parents, godparents, chambelanes (attendants) and three people to read the lessons generally takes place one week before the service. A deposit of $100 is required in advance to reserve the date. We can help with flowers for an additional $100. We can also recommend musicians.